Banarasi Sareeis an Indian woman’s coveted possession. For a long time Banarasi Saree has been an important part of the Indian bride wardrobe and rarely fails to flatter a woman, making her feel delicate and feminine. The Banarasi sari speaks volumes of the genius of the traditional weaver. The Banarasi saris became more popular during the Mughal era and the sari weaving art reached its zenith.The Banarasi sari comes mainly in four different varieties. They are pure silk (katan); organza (kora) with zari and silk; georgette, and shattir. Sari weaving is kind of a cottage industry for millions of people around Varanasi. Most of the silk for the Banarasi saris comes from south India, mainly Bangalore. 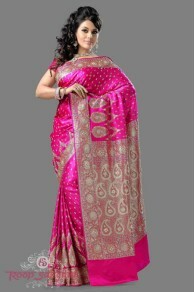 In an ideal Banarasi Sari there are around 5600 thread wires with 45-inch width. The weaving of Banarasi sari involves teamwork. Ideally three people are engaged in making the Sari. One weaves, the other works at the revolving ring to create bundles. At this point, another important process begins. This is related to designing the motifs. There are several traditional artists in Varanasi who, create wonderful designs for Saris. To create design boards, the artist first sketches on graph paper with color concepts. Selection of the final design follows creation of punch cards. For one design of Banarasi sari, one requires hundreds of perforated cards to execute the idea. The prepared perforated cards are knitted with different threads and colors on the loom and then they are paddled in a systematic manner so that the main weaving picks up the right colors and pattern. The normal Banarasi Sari takes around 15 days to one month and sometimes more time to finish. However, this is not a hard and fast rule as all depends on the complexity of designs and patterns to be produced on the sari.